Just what is it that makes a sequence of games into a series? There is no one good answer, and even the most common definition changes depending on what genre you�re talking about. Among action games, characters tend to be paramount, especially the starring roles. Mario games feature Mario? (or occasionally his brother Luigi?, or perhaps his nemesis Wario), even as they add new features with abandon, transition from two to three dimensions, and dabble in sports and racing. Sonic games star the titular hedgehog and his increasingly unwieldy menagerie of friends, while frequently diverging so far from the mechanics of the first few games that some older fans would just as soon disown them. In the realm of RPGs, on the other hand, it is frequently not characters but gameplay, setting, or other less tangible aspects that bind a set of games together. The Dragon Quest series stars characters generations apart from one another, if indeed they are connected at all, but features game mechanics that have remained remarkably stable over a period of decades, with most new games introducing only the most incremental of changes. The Final Fantasy franchise goes even farther, with most games sharing neither characters nor setting, and often the gameplay changes radically from one installment to the next as well. Really, the only things guaranteed to tie FF games together are a small set of recurring names, similar magic spells, a few musical cues, a certain grandiosity of story, and a large production budget. The Suikoden series exists somewhere between these extremes. In terms of setting, the games traditionally take place on the same world, though they may be separated by an expanse of both time and physical distance. Typically they share only a few of their large cast of 108 recruitable characters. Stories tend to center around politics and a long process of gaining allies in a local struggle; potentially world-shattering powers may be involved, but they�re not the focus. Gameplay follows a pattern of layering variations on top of a basic but speedy battle system. Each character specializes in a single weapon type -- a traditional undoubtedly grounded in the fact that replicating detailed battle animations for such a large number of potential sprites in the first couple games would have been prohibitively expensive. 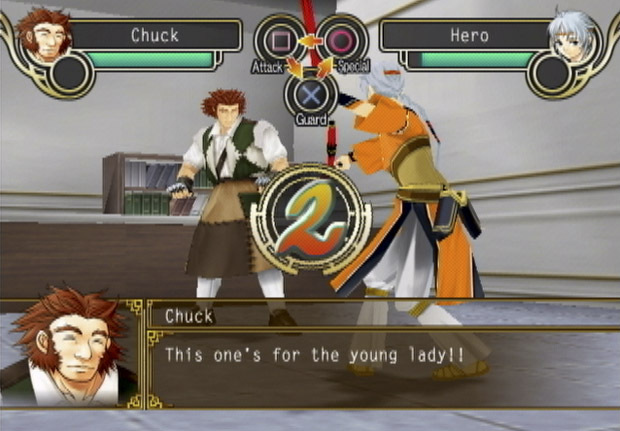 In addition to normal party battles, each game also allows for rock/paper/scissors style one-on-one duels, as well as large-scale battles, the latter of which tends to change radically with each new game. And finally there are the legendary True Runes, which provide both an over-arching mythology for the series and a basis for the magic system in battles. 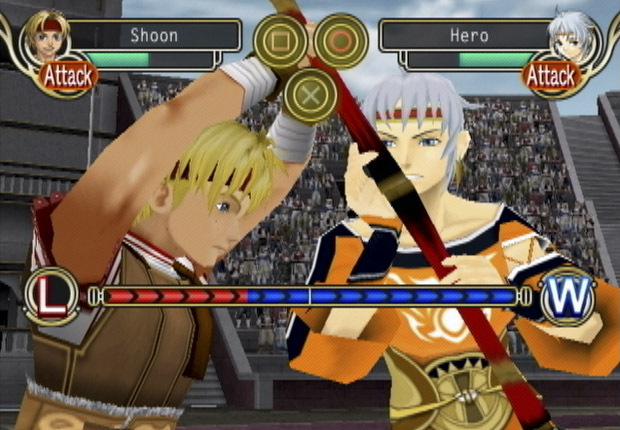 Suikoden V, released in 2006 for the PlayStation 2, hews closely to these series traditions. 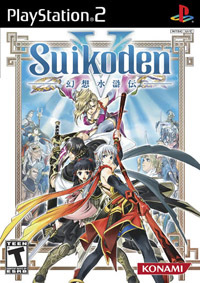 Perhaps in reaction to the perceived issues with Suikoden III�s flurry of innovation and additions, including multiple points of view and the sometimes-awkward paired battle system, followed by Suikoden IV�s often disappointingly conservative back-pedaling with smaller parties and stripped-down systems, Suikoden V seems to tread the middle path. It hearkens as far back as Suikoden II for plot and character inspirations while carefully picking up and massaging the most useful gameplay systems from past installments. Continuity-wise, Suikoden V takes place six years before the beginning of the Gate Rune Wars chronicled in the first Suikoden, and it includes a few characters seen in that game and its immediate sequel -- notably Georg Prime, Lorelai, and Killey. The plot starts out slowly, but after a sharp left-turn from the �Oh no, mom�s gone evil!� red herring telegraphed by trailers, it delves into a familiar but rousing clash of political factions, foreign allies, desperate deal-making, and brilliant strategies. For the battle system, we return to a full six-character lineup but do away with the paired character system from III. Instead, Suikoden V introduces the concept of formations. Acquired mostly in treasure chests throughout the game, these tactics place your characters in a variety of configurations which impart various stat alterations and add a special command to your in-battle repertoire. They offer a quick way to tilt your advantages in favor of your particular play style or to tailor your group�s strengths to the current circumstances. Meanwhile, the Skill system also returns, with characters possessing various affinities for different areas of expertise in which they can be trained -- be it hitting harder, more accurately, or more frequently -- or practicing one or more varieties of magic. As for non-standard battles, duels remain largely the same as they have throughout the series, though with much more detailed animation sequences as they play out, while larger battles are once again wildly revamped. They somewhat resemble the strategic battles of Suikoden II, maneuvering multiple units around a field, but trade up from a turn-based grid to something resembling a free-roaming real-time strategy game. As with most completely new systems, there are a few annoying quirks -- like the tendency of units that have lost a skirmish to retreat in exactly the wrong direction -- but on the whole, the combination of land and water battles, multiple rock/paper/scissor advantage triangles, special units, runic assists, and strategic possibilities make for a meatier and more engaging experience than most previous titles� takes. Speaking of runes, the game follows the recent tradition of advancing the series mythology oh so minutely. A single new True Rune, the Sun Rune, is revealed, along with a few new associated unique runes. The backstory of a few characters who showed up in chronologically subsequent titles are filled in. The origins of resident mistress of mystery Jeane are ever-so-slightly hinted at. Some more dribbles of informations about off-screen nations such as Kanakan are doled out, while entire new continents and cultures are revealed in tantalizing glimpses. The Suikoden world continues to expand, leaving long-time series fans eager for more. More of that world, as it turns out, is exactly what Suikoden Tierkreis would not provide. 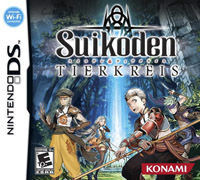 As the first full Suikoden RPG on a portable gaming system -- card-game spinoffs notwithstanding -- Konami forged a mandate to bring in new players to the franchise. To this end, they decided that the detailed world built up by the previous five titles and their multiple side-stories was perhaps too intimidating a barrier to entry for newcomers, and this new game would be set in an entirely new world. It is possible, at a stretch, to assume that the world of Tierkreis is in fact one of the �million worlds� referred to in the earlier Suikoden games, from whence came the dragons and beings summoned by the Gate Rune, but this hypothesis is pointedly not mentioned within the game itself. 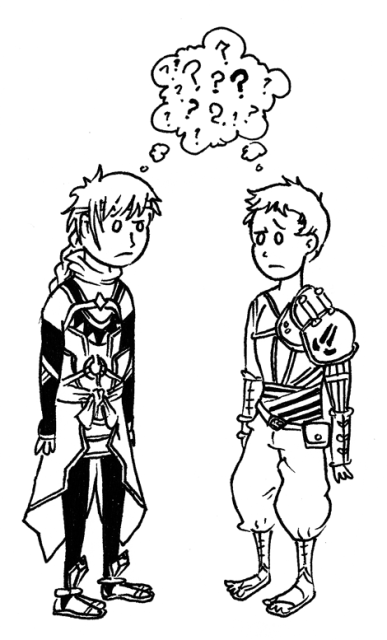 Is this, then, a Suikoden game? Well, to be pedantic, it says so on the box. And it does contain the series� trademark 108 recruitable characters, after all. But how does it stand up beyond that? 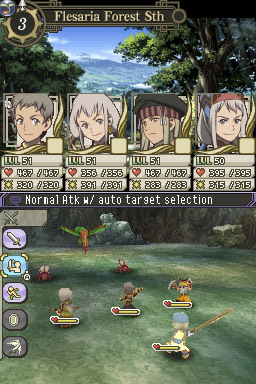 In keeping with the theme of making things easier for the newbies, the battles are a sort of hybrid between the Suikoden series standard and a more traditional RPG system. Characters can now wield a variety of weapons that are purchased in shops rather than sharpened by blacksmiths, though each character has a limited set of types available, maintaining some differentiation between them. And honestly, why not, since the simple 3D graphics engine makes such an option easy to support? In this case, the break from tradition opens up more options. Meanwhile, perhaps more jarringly, runic levels are also gone, replaced by a standard MP pool. In fact, runes themselves are nowhere to be seen. They have a rough analogue in �Marks of the Stars� acquired throughout the journey, but instead of being equipped to characters individually, each Mark picked up gives every character a new spell or ability, albeit a different ability that tends to be tied to their individual personality. In the beginning of the game, when you have only a few Marks, this feels limiting, but later on it opens up a good variety of options while maintaining a unique feel for each character. Despite these changes to almost every aspect of battle, there are still attributes that keep fights feeling like Suikoden skirmishes. As in previous titles, attack animations will play out overlapping one another whenever possible to speed things along, though this is sometimes small comfort in some of the longer dungeons with their too-high encounter rates. Also, the series� staple flashy combination attacks return, a nice bit of familiarity amongst all the revisions. It�s somewhat disappointing, though, that in another concession to simplification there are no special duels or large-scale battle systems. Both one-on-one combat and multi-party scenarios play out within the standard battle framework. Outside of battles, Tierkreis derived its method of navigation from Suikoden III, with far-flung locations being reached on a simplified world map of dotted paths between areas of interest. There�s a potentially involving time-of-year system, with days passing as the player travels to distant locales, but it only comes into play during a few sub-quests and isn�t usually relevant. Plot-wise, Tierkreis is obviously laid down on a completely blank slate, and at first it doesn�t seem too promising. The beginning of the game suffers from an embarrassing degree of hand-holding, as the plucky village boy with mysterious origins is practically dragged bodily from one cutscene to the next, with each development in the struggle against an obviously evil and powerful cult gone over several times in excruciating detail. It doesn�t help matters any that the voice acting in the game�s opening hours is, to put it charitably, rough -- especially on the part of the main character, who seems to be trying to give the MicroMachines spokesman a run for his money in the words-per-minute department. Fortunately, both of these aspects see great improvement as the game progresses. The actors fall into their roles and characters sound downright natural by the later parts of the game. (Only the voice director, or maybe Konami�s accountant, knows why they couldn�t go back and re-record the earlier segments.) Meanwhile, the initially facile plot expands to encompass more and more factions, politics, outsiders, and double-crossers, coming more to resemble the Suikoden style we know and love. Yes, it flirts a little more than usual with the dreaded End of the World scenario towards the finale, but at least for a while, it still feels like Suikoden. One can only hope we get more. But if so... maybe we could tie it back to some of the unanswered questions from the main series after all? Recent rumor has it that Yoshitaka Murayama, the original creator of Suikoden who left some time during the development of Suikoden III, has been contacted with an offer from an unnamed company. Yeah, that�s not much to go on. But hey, there are a million worlds out there... anything�s possible.